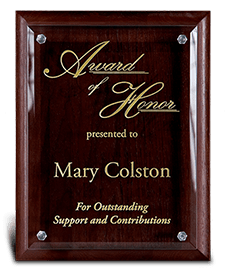 Employee recognition plaques, engraved crystal awards and customized plaques provide limitless opportunities for rewards, appreciation or even just a heartfelt thank you. They play an important role in employee recognition programs as a way of recognizing a wide range of events and occasions. 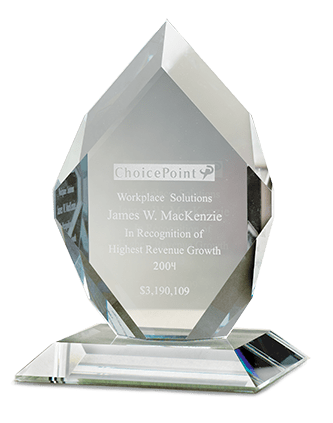 Functional for a variety of purposes – employee recognition, personal or professional achievement, outstanding performance or generosity – there’s always a good reason to show appreciation by giving engraved crystal awards or employee recognition plaques during a presentation. A custom recognition plaque or desk award is a unique symbol of achievement. Terryberry offers exquisite designs for corporate employee recognition programs. Plaques and engraved awards can be used for achievements and milestones in each type of employee recognition program: sales, service, safety et al. For occasions that require sharp distinction, these unique symbols of achievement offer customized designs and honor exemplary service to the organization. When you need a unique award design for desktop display, you’ll want to check out Terryberry’s selection of desk awards. 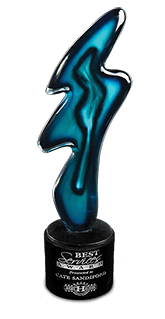 From stone awards and classic marble awards to modern glass and steel designs, you’ll find an exciting array of unique desk award designs to commemorate any achievement. Nothing makes a statement through employee recognition programs like these rich employee recognition plaques of distinction. Black brass on walnut or cherry plaques set these awards apart from all others. Personalized with recipient information and the ability to be customized with your logo makes this a terrific presentation option. 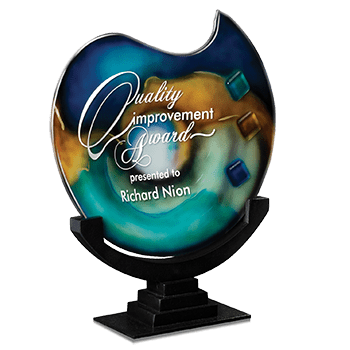 Our collection of finely crafted acrylics make excellent tributes as well as great motivators in corporate award and employee recognition programs. 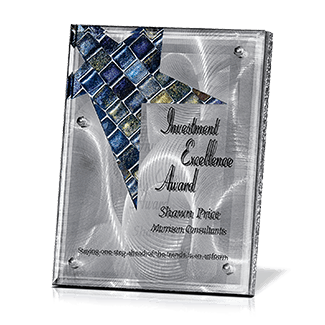 Each award is artfully rendered in high quality acrylic, then beautifully engraved with your logo, recipient’s name, and their achievement. Any company, organization, or group understands the value of publicly honoring those who work so hard for the cause. 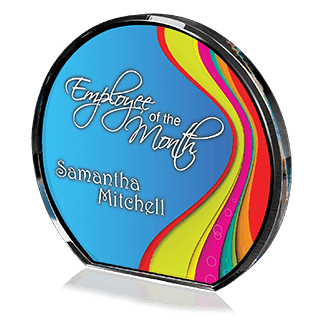 Perpetual employee recognition plaques feature walnut-tone boards & polished plates. Add just the right message for the perfect tribute while offering continual incentive for achievement. Terryberry offers a distinctive collection of heirloom quality glass and optic crystal awards with engraving that will serve as show pieces in the homes, offices, and lobbies of your customers, vendors, and employees. Each corporate award is uniquely designed and crafted for a lifetime of cherished memories and pride. No other award materials can match the ability of glass and crystal to commemorate a special event or showcase appreciation for years of service or top performance.